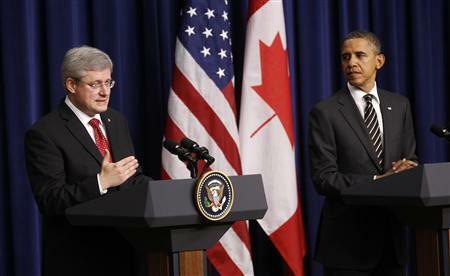 What will happen to Canada-US relations if President Obama rejects the Keystone XL pipeline? While the Harper government waits — with bated breath — for the Obama administration to make a decision about the Keystone XL Pipeline, there are suggestions that a rejection would "ruin" US-Canada relations for years to come. In a column published in the Globe and Mail, journalist John Ibbitson suggests that senior government sources have told him that a 'No' to the pipeline would result in a "deep freeze" reminiscent of the Chretien-Bush era. Vetoing Keystone would transcend the chagrin of the Bush administration over the Chrétien government’s refusal to support the American invasion of Iraq. It would dwarf the softwood lumber dispute. Border co-operation initiatives could be put on hold. Canada could flatly reject American proposals to reduce agricultural and intellectual property protections at the Trans Pacific Partnership talks. Most important, the thousand different ways in which Canadian and American officials work closely and co-operatively together daily would be replaced by a Canadian cold shoulder. You have to wonder, however, if shunning our biggest trading partner would be a wise choice. Experts tell Yahoo! Canada News that, if Keystone is rejected, we can't afford to hold any grudges. "Canada has by far too much at stake in its relations with the US to permit anything said or done in Canada to make Canada more vulnerable or to take action that in effect cuts its nose to spite its face," Paul Frazer, Canada-U.S. government relations specialist at 3Click Solutions in Washington, DC said. "Once official government statements are issued then I suggest Canada needs to get on with the job of taking care of its immediate interests on the energy front." Frazer added that Canada should focus on improving its environmental record and on other pipelines to other markets. Former Liberal MP and Parliamentary Secretary for Foreign Affairs Dan McTeague says Canada's immediate interests should also include taking care of our own demand for oil in Canada. "While it is convenient and perhaps short-sighted for Canada to stew over a possible rejection, the bigger picture and changing economic imperatives driven by many countries now tapping their shale oil/natural gas will continue to challenge Canada's oil outlook and its economic reliance on its access to foriegn markets," he told Yahoo!. "Rather than idle threats of potential frosty relations, Ottawa needs to reinvigourate emphasis on processing fuel in Canada and getting of their duff with respects to converting the TransCanada Natural Gas pipeline into a crude pipeline to carry Alberta oil to the Maritimes. "Economic imperatives and a reality check in Ottawa should come before the pouting."